Our centers offer a full range of orthotic and prosthetic solutions. In conjunction with our affiliation with a leading manufacturer of orthotic and prosthetic products, we can address virtually every patient need from custom orthoses to leading edge prosthetics. The best outcomes can only be achieved when patients, physicians, technology and care all work together. Spinal orthoses support and stabilize areas of the body from the neck (cervical spine) to the lower back (lumbar spine). These solutions are often used postoperatively to promote proper alignment and safe healing, to treat a chronic disease or condition such as stenosis, or to treat an injury such as trauma to the spine. Depending on the diagnosis and individual need, a custom spinal orthosis often delivers the most effective treatment. 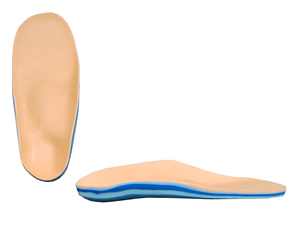 These orthoses are fabricated to a patient’s exact measurements and designed to specifically meet unique medical requirements. 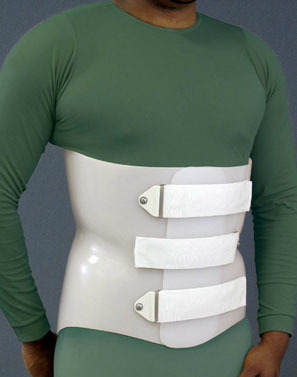 When it’s right for the patient and appropriate to the diagnosis, we also offer prefabricated spinal orthoses. Each of these solutions are designed and selected with lightweight and ease of use in mind. Children are the hope and future for all of us. At the Orthotic & Prosthetic Centers, we are passionate about giving them the finest care available. Our pediatric teams are built around orthotists who are committed to advanced training and ongoing education. These clinical leaders ensure your child is treated with up-to-the-minute clinical expertise and the latest technology. From infant to toddler, adolescent to young adult, we understand the importance of treating patients throughout life’s journey. We offer mobility solutions that address the head, neck, back, lower and upper limbs, as well custom solutions for conditions such as plagiocephaly, scoliosis and cerebral palsy. Plagiocephaly is asymmetry (unevenness) in the shape of a baby’s skull. 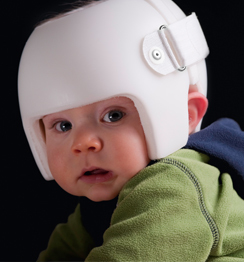 To treat children with moderate to severe skull asymmetry, a custom corrective helmet is designed and manufactured to reshape the skull over time. Adolescent Idiopathic Scoliosis (AIS) is an abnormal curvature and twisting of the spine that affects children during adolescent growth periods. We offer a range of pediatric scoliosis bracing options to manage and treat AIS, including full time and our night time Providence Nocturnal Scoliosis Orthosis orthosis. Upper and lower extremity orthotics can reduce the weight placed on a joint, help movement, restrict movement or even promote the development of a part of the body. In general, orthotic devices can help treat a broad range of conditions, including: decreased mobility, chronic disease, birth defects, and many others. Working with you and you physician, our primary goal is to identify and fit an orthotic solution that helps you live the life you want. We are always here to address any issues you may have, answer your questions and make certain we’re doing everything possible to achieve the best outcome. 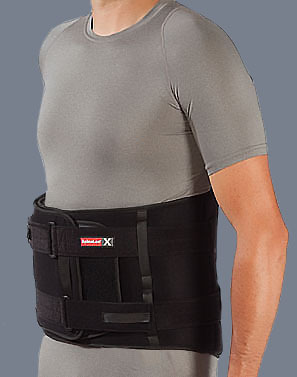 Upper extremity orthoses are braces and supports designed for the shoulder, arm, elbow, wrist and hand. They are used to address a range of needs from stability to immobilization. and include three main areas of orthoses: Upper extremity positional supports, upper extremity soft supports, and upper extremity fracture orthoses. These orthoses are designed to position an upper extremity, such as the wrist, arm or shoulder, to prevent unwanted contractures, maintain proper alignment, provide controlled range of motion to aide in physical and occupational therapy. Often called soft goods, these orthoses include braces that are made with neoprene, canvas, and fabric. They may also be reinforced with metal or plastic stays for additional support. In the case of fractures, the type and location determines the appropriate orthosis. If the fracture site is near a joint, it is often common to stabilize above and below the affected area to reduce unwanted motion. This type of orthotic is designed to help improve muscular or skeletal structure of the knees, ankles and feet. There are many causes of problems in the lower extremities and numerous orthoses designed to treat them. Whatever your need, our specialists will work with you to make certain your orthotic device is properly designed and fitted to help you get the most from it. Foot orthotics evenly distribute pressure over the entire plantar surface of the foot, alleviate sensitivities or pain, accommodate or correct deformities, and improve the overall alignment of the foot, ankle, leg and lower limb. These orthoses are designed primarily to aid in ankle stability or treat chronic ankle sprains and strains. These orthotic supports include: semi-rigid or rigid orthosis, rigid ankle orthosis, gel or air orthosis, as well as custom orthotics made specifically for a patient’s foot. AFOs provide support, proper joint alignment to the foot and ankle, assist or substitute for muscle weakness, and protect the foot and lower limb. 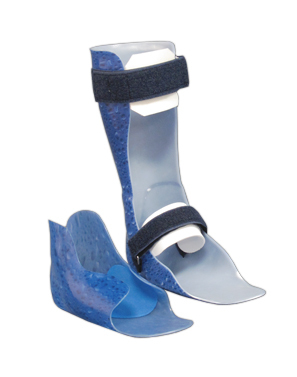 These orthoses are typically available in metal or plastic and are rigid, semi-rigid and/or articulated. 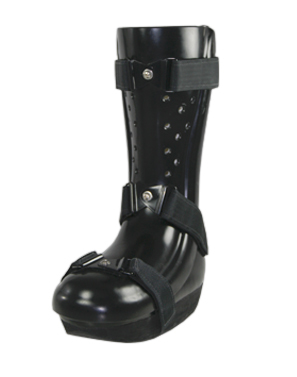 Walker boots are designed to aid in foot and ankle stability and limit the range of motion. They provide a solid or articulating ankle joint to treat injuries, fractures, chronic conditions or disease. 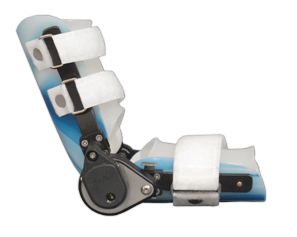 Each orthosis has a removable inner lining, malleolar (ankle) pads for additional stability and comfort, and a rocker bottom sole for a smooth walking pattern. These orthoses designed for preventative protection and to stabilize the knee. Injury to the ligaments of the knee can cause unwanted motion between the femur and the tibia. If left untreated, this can create significant joint laxity, lead to degenerative joint changes and put the patient at risk for further injury. 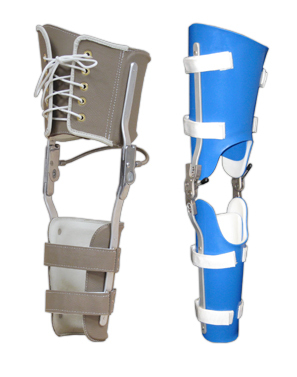 Functional knee orthoses can be made by measuring the knee or by making a custom model of the leg. Knee immobilizers are often used to stabilize and immobilize the lower extremity postoperatively and during the acute stage of knee injuries. They provide maximum immobilization of the knee joint and compression. KAFOs are designed to provide support, proper joint alignment to the knee, foot and ankle, assist or substitute for muscle weakness, and protect the foot and lower limb. They are made from a variety of materials including metal and plastic. Distal tibial/fibular fractures can be treated with a walker boot or tibial fracture orthosis. Your physician determines which style of orthosis is best suited to your unique injury. Reciprocating gait is defined as simply putting one foot in front of the other. RGOs are designed to help patients that suffer from spinal cord injury, myelomeningocele, spina bifida, and other paralytic disorders walk. This devise is also used to provide improved movement for paraplegic patients. These devices are designed to maintain appropriate anatomical alignment of the hip or prosthetic hip replacement. The components include a hip/pelvic girdle, thigh cuff, and hip joint. The joints are usually adjustable and set in some degree of flexion and abduction. This alignment positions the head of the femur in the acetabulum allowing for the ligaments, bone, and surrounding musculature to heal. These devices are also used to stabilize patients who suffer from chronic subluxation or dislocation of the hip. 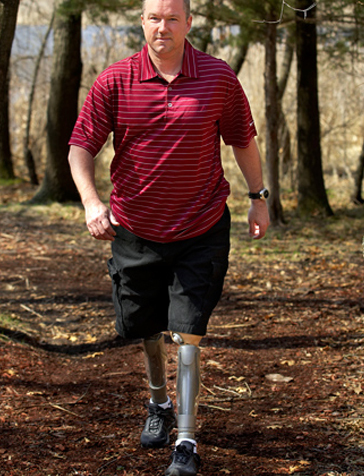 The Orthotic & Prosthetic Centers are dedicated improving the lives of our patients by providing state of the art prosthetics that help them lead the active life style that they want. 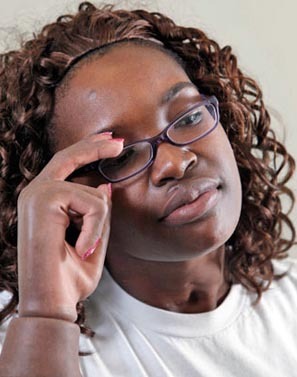 We offer a team approach to rehabilitation that sets the highest standard of care. We are dedicated to bringing together the physician, prosthetist and physical therapist as well as the patient and his or her friends and family. In our view that is the best way to optimize patient outcomes. Innovation and diagnosis specific solutions are key to delivering upper extremity prosthetics that meet unique patient needs. Our prosthetists are here to answer your questions and find the prosthetic that matches your lifestyle. We provide patients with lower extremity prosthetic devices that combine the latest technology and the highest quality lightweight materials available. Our focus is helping each patient reach his or her goals by creating a prosthesis that is practical, comfortable and aesthetically appealing.